The Weekend of June 30th and July 1st saw a number of Relay for Life events. Some were big, and some were small. One of the bigger ones on Saturday was the "Woodstock: Summer of Love." It was in Nantucket Channel, held by Sail4Life, and went from 9AM to 9PM SL time (Noon to Midnight EST). Hopping by the place at the time DJ Benny (aka "Benny the Boozehound") was playing, it certainly looked like Woodstock. The area was mainly grassy field, with a stage at one end, which held the performers and where most of the people partied. With the theme, the majority were either dressed like hippies or were nearly naked. The event area was large on it's own, but surrounded by scenery paneling to make it look more like the countryside. There were a few campers and campsites. At the stage, there was about one new performer every hour for the 12 hour event. Besides the dancing, one could mess around in the mud hole, or one could skinny-dip in the pond. 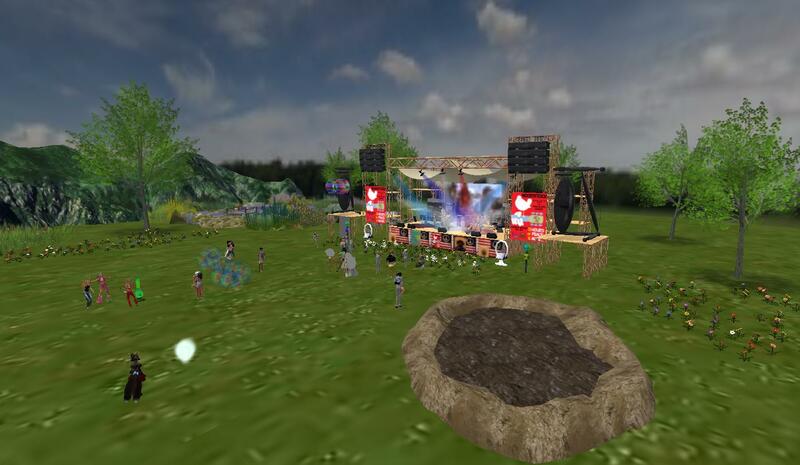 Besides collecting money in the RFL kiosk, the Woodstock event had another way that fit with the theme. People could buy a flower for the event by donating fifty Lindens, and dedicating it to a friend. As time went on, went the inevitable jokes about stoned hippies and while having cleaned up their act years later still looked back at their wild youth with fond memories. DJ Benny shouted at one point, "Now you can tell everyone you WERE at Woodstock!" Someone else joked in response, "If you can remember being at Woodstock, you weren't there." Sunday at the Steelhead Estates was one of their last big events for the Relay season, the "Steelhead Critter Races." 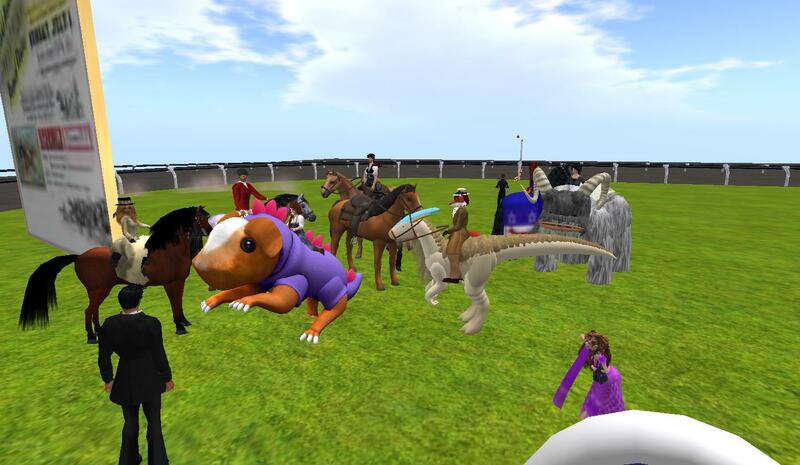 A Benefit Event for Relay For Life in Secondlife, sponsored by Team Steelhead Salmons & the Steelhead Public Library. If you have a critter and it can be raced, this event is made for you! 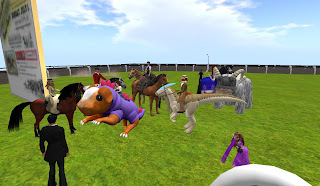 Bring your horses, tigers, ostriches, banthas and other ridable critters! You are critterless? Ostrich is lame? Bantha has mange? Then drive one of our free Roman Chariots! The race was held on a track high above Steelhead Port Harbor, with Sheriff Fuzball Ortega in charge of the event. The race attracted a number of contestants and onlookers, some of the latter whom also brought their own mounts. Besides the horses were a number of exotic mounts, including a "Star Wars" Bantha, a "Cyantian Chronicles" Shiave, and a "Guineapigasaurus." The latter was a horse-sized ridable guinea pig brought in by Mindy, one of Steelhead's kids whom amused/annoyed the others around with it's squeaks, "breeep, breeeep, breeeep!" There were four races in the event. Although there was a race for any kind of rideable ground mount, no flying mounts were allowed. Also, players could not be the mounts either. There was some debate as to why the second rule, either because of possible jokes about a girl being "mounted" by her boyfriend, or that Fuzzball's fiance Eugene Burton might take advantage by riding him around in his wolf form more often, riding crop in hand. Before the official races, there was a practice lap taken. After that, there was an entry fee of 500L per race, or a one time payment of 1500L for all of them. They were entered by both those from Steelhead, such as Baron Klaus Wuffenbach, and from outside such as Liska Fuchs. The first race was "Reasonably Sized Critters," any mount that could fit in the starting gates, whether horse or exotic mount. The second race was "Unreasonably Sized Critters." 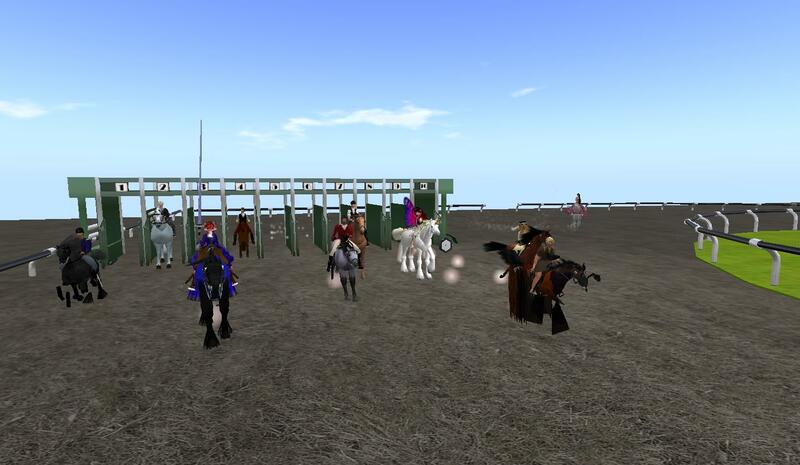 The riders had to go into the starting gate without their mounts, run to the cycle in front of them when it started, rezz their mount, then start running. The third was a normal horse race, although the horses themselves were a variety of kinds from breedables to statics. Baron Wulfenbach loaned his huge horse to one contestant. The first and third race were won by the same rider, whom had an experienced breedable horse. As it turned out, the horse might have given him a small edge as this particular breakable can be trained to run faster. The fourth race required no fee, or mount of one's own: the steel chariot race with piston-powered mechanical horses provided for free. Trouble was, the chariots were so fast, they proved difficult to steer around the track, getting caught on the walls, tipping over, or getting caught at the starting gate after a lap. Following the races was a party held by DJ Thadicus Caligari, in which the former competitors and onlookers joined each other for music and dance. Hello everyone, I just wanted to send a reminder that there will be a memorial for Jeffry Pastorelli TONIGHT, Sunday July 1st. 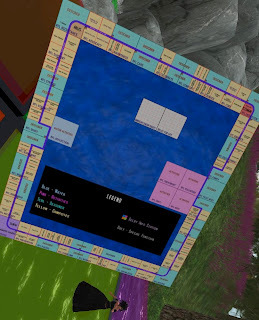 This is being held by Mike Burleigh at 7 PM SLT at Remembering Our Friends, landmark attached. Please be there if you can, as this means a lot to us all. The event had a moderate attendance, with among those attending Trader1 Whiplash and Lomgren Smalls. Mike Burleigh was in charge of the music, but much to his irritation, he had some problems getting his stream online, and the problems persisted throughout the event. Lomgren Smalls, whom helped get people to the event, rezzed a kiosk for his team, the Passionate Redheads, and the money began to pour in. While this year's Redhead events often brought in just several thousand Lindens each, this one was bringing in tens of thousands, bolstered by some promising to match the donations of others. That the money was coming in despite the stream being down led to some jokes, "Can this mean that the music in SL is so bad that people will pay NOT to hear it?" People talked about Jeffry during the event, "I know he made a huge impression on me. And still does to this day." "I miss him, even if he was a pain in the a** most days" "You know, we wouldn't have loved him as much if he wasn't a pain in the a**." "I can still hear him cussing in the living room when things pissed him off too. He was passionate." "Yes he was. And that passion rubbed off onto so many of us Relayers." During this time, someone tried to display a copy of the Relay Weekend sims map. But as the area didn't allow for rezzing on the ground, he tried to wear it. But as his avatar moved around, so did the map. Trying to get more than a glance at it was a big challenge. By the end of the event, 35,000 Lindens had been raised for the Redheads, the team that had struggled this season, bringing it's season total to 245,000L and was a much needed morale boost. The following day, the total would pass 250,000 Lindens, and get the Redheads the Gold standard. More on Jeffey Patrelli can be heard at a special episode of Designing Worlds, taped at the Remembering Our Friends Memorial (Click Here). It was quite a weekend with many events, most of which we don't have the time to mention. And as the Relay moves on into July, the Relay Weekend approaches, with nine days left as the prining of this article, the weekend of July 14 and 15, with the Relayers anxiously anticipating the climax to the season.